$17.50 In stock. Order in the next 3 hours, 25 minutes and it will go out today! In stock. Order in the next 3 hours, 25 minutes and it will go out today! The ultimate floating bottle cap with a KILLER Karate Finish! 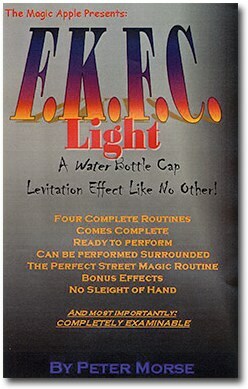 If you'd rather not levitate the water bottle cap, you can perform this without floating the cap. Borrow a bottle cap, toss it in the air and then STAB it with your finger! You are left with a water bottle cap with e HOLE in the middle! Everything is COMEPLETELY examinable! Perform this with or without a jacket! Comes complete with caps and ALL the materials needed to perform! It can be performed surrounded!